If you're looking for a memorable experience while you're staying in Biloxi, look no further than the award-winning Beau Rivage Resort and Casino. Conveniently situated on the beach in Biloxi, the Beau Rivage boasts a whopping 1,740 guest rooms in its 32-story hotel, more than any other along the Gulf Coast. The rooms were recently remodeled in 2006 after Hurricane Katrina and also includes 95 luxury suites. If you're here for the gaming, you're in luck. The 85,000-square-foot casino floor has everything, from a 16-table poker room to more than 2,000 slot machines. Table games are always popular, and for the high rollers, there is a special room just for you, where you can enjoy high-limit slots, blackjack tables, a bar lounge, private restrooms and private cashier services. Want to be entertained? The Beau Rivage Theatre is one of the hottest tickets in town. The 1,550-seat theater has hosted some of the biggest names in music and comedy, including B.B. King, Tony Bennett, Chicago, David Cook, Jay Leno and Chris Rock. 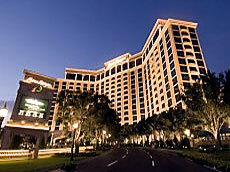 Some of the best dining options along the Gulf Coast can be found at the Beau Rivage. Twelve restaurants and four bars/lounges are on the premises, guaranteeing that there is something for everyone in the family. Try one of the signature steaks at BR Prime or get a taste of Asian cuisine at Jia. For a more casual approach, the Buffet can't be beat or have dinner pub-style at Coast. Finish off your dinner with a cup of coffee at The Roasted Bean or some ice cream or homemade gelato at Scoops. If you're having drinks with friends, EIGHT75 is the place to be as it's one of the most popular nightclubs on the Gulf Coast. Shopping is plentiful with 12 retail shops, as well as a full-service spa and salon. The tropical outdoor pool with private poolside cabanas is a great way to beat the summer heat. And if you're an avid golfer, be sure to check out the exclusive Fallen Oak golf course, just 20 minutes north of the Beau Rivage.